You are sipping your morning coffee and enjoying your wonderful Tim Horton’s Donuts, life is wonderful. Your email client opens and you start progressing thru your emails and then you read it. Your life comes to a screeching halt. That donut no longer tastes so good and you fall into a fast state of shock. However, you calm down and read the email and follow the directions from the support team. Within a few moments your site is back on line and things in your stomach start to feel a little better. The above scenario is one that all web hosting clients could face one day. 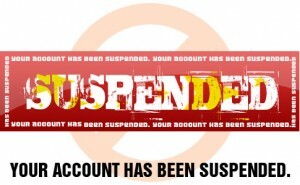 Let us take a few moments to go over some of the reasons why your account could be suspended by our admin team. Exceeding your storage and bandwidth limits. Frequently using up lots of server resources (CPU , Disk I/O and memory). Spam email messages being sent from your account. Hosting or linking to material that violates your Host’s Terms of Services. Attempting to gain unauthorized access to another customer’s account or files. Using your account to send out denial of service attacks. Hacking activities or hosting of material related to hacking. Unpaid invoices for web hosting. One of the most important things you can do as a web hosting customer is to keep your account up to date with the most recent releases of the software you have installed.Also, be sure to maintain your account with strong cPanel and Email Passwords. The vast majority of suspended accounts happen due to compromised 3rd party scripts, plugins and or weak passwords. A good majority of suspensions can be easily avoided if only the client would have taken the time to follow the above. There are many reasons why a host will suspend your account. One of the best things to do is make sure you keep a good email address on file with your host. Almost every host will send an email to the account holder informing of the suspension. It is always a good idea to make sure you use an off domain email address, this way your host can contact you even if your site is suspended. Many clients point their contact email to their cell phone so that they receive instant alerts from their host. This is a great idea! If your account is ever suspended, simply follow the instructions in the email you received from the support team and we will work with you to get your site back online as quickly as possible. While being suspended is dreadful it is not the end of the world. We put together this short video that explains the suspension in a video format, I hope you enjoy. thank you for the information.any recovery option are available ?